I have many gripes about Apple but there is NO WAY that I would switch to android. I am sure Apple will be blocking this somehow. Great! Now all the former fanboys trashing Apple every day here have a tool to leave the platform. Let’s hope they use it. Unless they are using private iOS APIs or copying information for transfer that is not allowed to accessible across the sandbox, I don't see an issue with it. This certainly doesn't look like a Trojan horse feature, and it makes sense and that data copied to Google Drive would be formatted in a way that's most accessible to other platforms. Apple does this with iCloud for Windows, as well as having specific Windows Migration Assistant and Move to iOS (on Android )migration tools. Is Google blocking Move to iOS? Nope. I can't think of a reason for Apple to block iOS to Android migration tools. Funny that Move can bring more items over to the iPhone (like SMS) than Google can bring back. Simply because Apple has stricter privacy permissions than Android. Meaning any migration tool will always work better going from Android to iOS than iOS to Android. SMS/iMessage is a HUGE one for me. I keep a lot of conversations around, sometimes even years after they're finished. Very useful if you want to go back and check a conversation you had with someone (for me a big one is tenants and discussions over any agreements we made). And this is one area Apple doesn't allow developers to access. There isn't even a Permissions setting to give you the option to allow access. Same for call logs. Funny that Samsung has had a app called smartswitch that could do all of that for well over a couple of years now. It can transfer over pretty much everything from iOS to a Samsung, including sms, pretty easily. I agree. Anyone daft enough to want to leave Apple for Google's mobile OS should be aided in every way possible. The app name should perhaps be changed though. Is 'Don't let the door hit you on the way out' too long do you think? I heard that the tool comes with built in recommendations for psychiatrists in or near your zip code, because what kind of lunatic would move from iOS to Android? Perhaps I should have clarified my post. No legal tool that abides by the Terms & Conditions of either Apple for iOS or Google for Android will ever be able to get as much data from an iOS device as it can from an Android device. Smart Switch (like all those iCloud browsers) is not abiding by Apples Terms & Conditions because they are accessing iCloud by tricking it into thinking it's iTunes or an iOS device doing a restore. I'm actually surprised Apple hasn't sued Samsung for this (I can see Apple ignoring the countless small developers who make this type of software). Perhaps they feel it's not worth it to have another Samsung v Apple trial or bad publicity around what would appear as Apple preventing a person from taking their data with them to another phone. The App this article is about (Google Drive) is limited in what it can transfer - specifically only things you allow it access to. And on an iOS device it's not possible to allow any App to see your iMessages or your call log. On an Android device you can grant access to this information. Fair enough. Wasn't trying to come off as bad as I did when I re read what I wrote. My apologies. Shouldn't I, as the owner of my information of things such as the call log and iMessage information, be able to take that where ever I want? I should be able to take all my information, from everything I use Apple wise, at anytime to anywhere I want. All Apple needs to do now is update their Move to Apple app from Android with the ability to transfer Google and Samsung Calendar, Google Photos along with maybe Memo and Notes including Voice Recordings then it will be so much more easier for someone to migrate there data from Android to iPhone. Another option I would also like to see is for them to give you an option to choose what can be transferred from Android smartphones that have external storage and give you the option to move the external data right to iPhone. Here's to hoping the iPhone 8 is great, because another same-old release and I might put this migration tool to use. When I was on android for many years, I personally never use the Google to store contact and such. I used to sync the phone with a computer and via outlook. Getting contacts and such move from one new phone to another was never a big deal. The issue I always had and I still believe it is the case depending on the phone and I will tell I only used Motorola so I know this was quirk with Motorola, Android OS as whole did not allow you to sync things like App prefs and set up information and save game states. SO that meant every time you update the phone and something the OS for the very few times I got an update, you lost all the other important things about using apps on a phone. With that said I know there were third party app that help transfer the non contact and calendar items which make the phone useful. But these things were a pain to use. Only the google phones actually worked kind of like the iphone from a backup standpoint but you had to use their cloud services which I did not like doing. Other than the iphone the issues still exist as far as I know that moving between non iphone does not set up the new phone exact as the old one. Apple nailed this and I do not mind moving to a new Iphone it is a 20 minute activity and I am ready to go. I recently went on play store to get the move to iOS app for my fiancée. 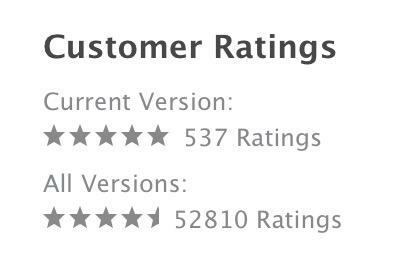 I was blown away by how many Fandroids downloaded it just to leave a negative review. There were as many one star reviews as 5 star. the overwhelming majority were whinging how iOS isn't open like the malware ridden android. Or how the file system is inaccessible. People that call themselves Apple fanboys can also be extremely petty, but I just checked out the Google Drive rating on the iOS App Store (first image) and it's night and day compared to Move to iOS on Google Play store (second image). That's a whole lotta time wasted to make a trivial complaint. Funny that Move can bring more items over to the iPhone (like SMS) than Google can bring back. Simply because Apple has stricter privacy permissions than Android. I was able to transfer my SMS history without any fuss. Admittedly not quite as simply as installing and app, but still ridiculously easy. Also (and this is quite nuanced) iOS and Android actually have very similar privacy permissions. On either system before an app accesses user data for the first time it needs to ask permission from the user. The difference is that Android allows developers to ask for access a wider range of user data than iOS. It's funny you phrase it that way. I'm completely convinced Android provides a better user experience than iOS, baring users already thoroughly embedded into the Apple eco-system. What raises questions isn't the OS but the hardware. The only phone running Android that is capable of trading blows with an iPhone is a Pixel, and even then it's evenly matched (e.g. the Pixel has a superior screen, camera and form factor but the iPhone is waterproof, true lens zoom and presumably better resale).